From time to time people post questions on ProZ's KudoZ section to ask for the "official" translation of this or that bit of literature: a poem, a quote from a novel, or whatever. THIS TRANSLATION IS DEEMED OFFICIAL AND APPROVED BY THE SECRETARY OF THE UNITED NATIONS DIRECTORATE for EMERGING ALTERNATE DOCUMENTATION (the UNDEAD). A translation by Pintor, one without any credits, one by an amateur, one by a blogger. Which one is the "official"? Pintor's, I would say (although I know there are is a more recent one, in a beautiful edition of Einaudi's Pleaide, and I would choose it as the official one, in primis because I know the translator, as she was my teacher at university and I know she spent something like 3 years on it). What has made it official: the translator's quality, the fact that it is published by a renowed publishing house, etc. 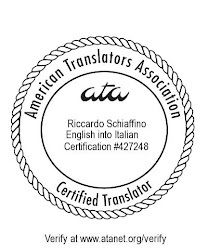 At any rate, one shouldn't compare technical translation with literary translation, and not only because of remuneration. This is, of course, my humble opinion.